The Saints managed to get a couple field goals in the first half, but the Vikings had control of the scoreboard. QB Sam Bradford threw two touchdowns to WR Stefon Diggs, one to put the Vikings far ahead just before halftime. In the second half, the Saints would add two more field goals and a touchdown from QB Drew Brees to TE Coby Fleener, but they would go on to lose to Minnesota 29-19. With that, we give you our PFF exclusive takeaways from the contest for each team. The offensive line gave Bradford time all night and he consistently delivered. 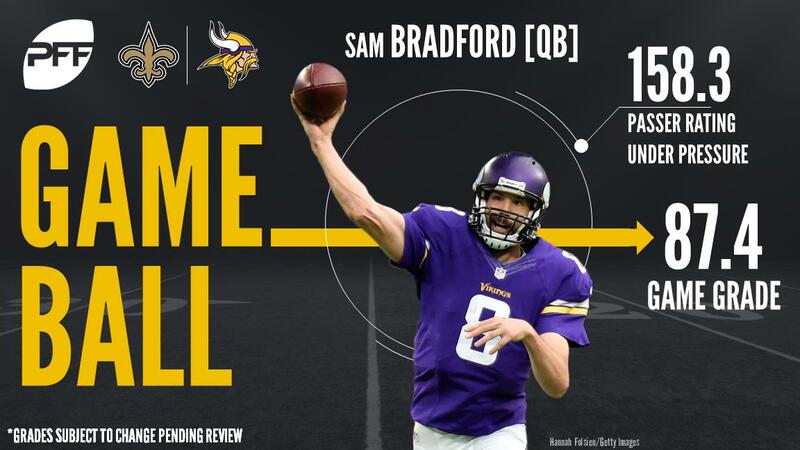 He was nearly flawless throughout the game, in particular on intermediate and downfield passes, where he completed nine of 10 attempts for 234 yards and two scores. Diggs was essentially uncoverable, as he repeatedly got loose deep into the Saints’ secondary. He snagged seven of eight throws sent his way for 133 yards and two scores, and Bradford’s passer rating of 154.7 when throwing to Diggs was the second-highest of any receiver this week. Despite the lack of scoring, Brees had a solid day moving the ball up and down the field. When kept clean in the pocket, Brees was 24-30 for 280 yards with a 116.7 passer rating, but he struggled under pressure, going only 3-7 for 11 yards and a 50.3 passer rating. The biggest issue with Brees and the Saints offense was the lack of production in the redzone, where they did not score a touchdown until two minutes to go in the fourth quarter when they were already down three scores. Brees did have a well placed pass that would have gone for a touchdown if not for a Brandon Coleman drop late in the third quarter and finished off the game with a well placed laser to Coby Fleener in the front of the endzone. Fleener was one of the few offensive highlights for the Saints in their opener. Fleener caught the two of Brees’ best throws of the night, a post in between two defenders in the second quarter and the lone touchdown of the game with CB Trae Waynes all over him. Fleener finished the game with five receptions on six targets (with no drops) for 54 yards and a touchdown. When Brees targeted Fleener, his passer rating was 143.8. While he did take an illegal hands penalty, Anzalone was one of the few bright spots on the Saints defense. He was especially strong in coverage, as he allowed just two receptions on four throws into his coverage for a total of just seven yards, including a pass defensed. Jordan was his usual self, as he was productive in all three phases. He notched a sack and three total pressures to go with two run stops and a coverage stop.